Microsoft 1031 Keyboard Covers help protect your keyboard from spills, dirt, moisture, debris, and other contaminants. 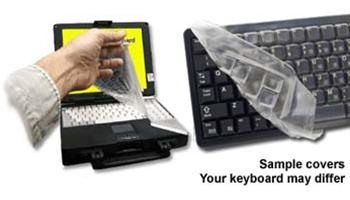 Keyboard protective covers wrap snugly around your keyboard allowing you to use the keyboard while it is fully protected from spills, dirt, sand, debris, and other contaminants. The covers are precision molded from flexible, durable, matte finish polyurethane material that will provide years of use. Laptop covers allow the lid to close for transport without removing the protective cover. The covers are easy to install. They can be safely removed without damaging the keyboard or laptop. The cover's non-glare finish leaves all keyboard markings and indicator lights clearly visible. The polyurethane material has a UV inhibitor to protect against yellowing. The clear protective covers feature self-adhesive flaps that help seal the keyboard for maximum protection. We have keyboard protective covers for hundreds of different keyboards and laptops and we are adding more everyday. If you do not see your keyboard model or laptop in our list, contact our Sales Department using our convenient contact form (or call 800-223-0123) to see if we have a cover that fits your keyboard.